How can I treat a cat with arthritis? 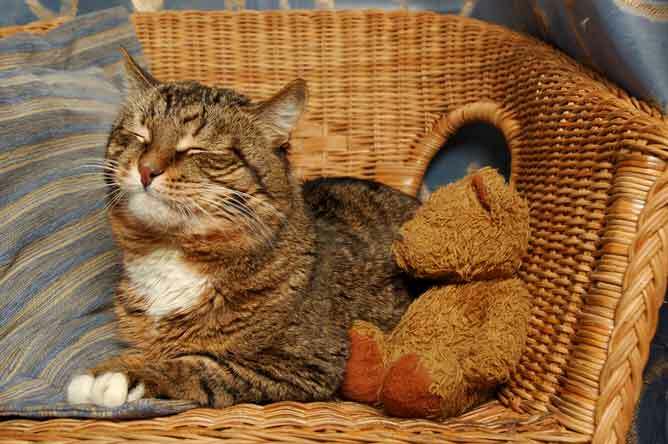 Find out how to care for a cat with arthritis. Our expert gives you essential information about arthritis in cats, and how you can help treat arthritis in your cat. Arthritis is an inflammation of the joints caused by the breakdown of the joint's cartilage, which means that the bones rub against one another resulting in stiffness, pain and loss of movement. This can spark off changes in the bones themselves, causing bony spurs and thickening. Arthritis is relatively common in cats. A vet can diagnose it by X-raying the joints, although changes in mobility and an inability to jump are the first signs. Veterinary medication, dietary supplements and prescription foods can help ease the condition, and some owners have found acupuncture eases stiffness. Is arthritis common in cats? We have traditionally believed that arthritis was uncommon in cats because they do not often show the long-term signs of lameness that other species, such as dogs, demonstrate when they are affected. But we now know that arthritis is common in cats - about 20 per cent of the whole population, and a much higher proportion of elderly cats, show signs of arthritis when their joints? are radiographed. So if cats often don't show the typical signs of lameness, how can we recognise the condition? It seems that affected cats can show a variety of signs, such as hiding away more than normal, crying if picked up, aggression, and running away if handled. But by far the most common signs are an unwillingness to jump, and if they do, a reduction in the height they are prepared to leap. This means that the owner of an affected cat will often notice subtle changes in their pet's behaviour patterns - but often not appreciate the cause. Examining a cat for arthritis also gives very unreliable results. As we all know, cats can be very bloody-minded, and cats with perfectly normal joints may scream and resent having them manipulated, and others with badly affected ones may not show the signs of swelling and restricted movement that we would expect. The only way to reliably diagnose arthritis in cats is to radiograph the joints (the elbow and the hip are most commonly affected). This does require an anaesthetic, or at least deep sedation, in order to position the cat correctly to get diagnostic radiographs. How can I help my cat's arthritis? It has been suspected for a long time that certain substances in the diet can help to control arthritis in a range of species. For a long time, cod liver oil has been used with varying effects - but cats have to be dosed very carefully, or it can have toxic effects. More recently, supplements containing glucosamine and chondroitin sulphate, that help the cartilage that lines the bone within a joint to heal, have become available for cats. They are safe, and effective in mild cases, but require long-term daily dosing in either capsule or powder form, which many cat owners find challenging. There are other dietary products that have been used to try and control arthritis in cats, such as those containing green-lipped mussel extracts, with varying success. More recently, Hill's Prescription Diet Feline j/d has become available, which has been shown to have a marked anti-inflammatory effect upon the joints. It achieves this by the balance of fish oils within the food, and in particular the balance between what are known as Omega 6 and Omega 3 fatty acids. Because of the high levels of fish oil in the diet, it is highly palatable to most cats, but it is also quite high in calories, so care must be taken to ensure that cats on the food do not become overweight. Of course, obesity is a major aggravating factor for arthritis. Keeping a cat slim may not stop the problem from developing, but it will lessen its effects. If an obese cat develops clinical signs of arthritis, weight reduction becomes a priority. Can complementary treatment help arthritis in cats? As arthritis is a very long-term problem, many owners are keen to try complementary treatments for their pets. This is fine providing that a vet has given the all-clear to use them. Acupuncture may well be of value, and there are some vets around the country who specialise in offering that type of care to cats, although it does need to be one that is amenable to that sort of handling! Up until recently, there have not been any licensed drugs for the long-term control of arthritis in cats. Many products that are safe for use in humans and widely available over the counter, such as aspirin, paracetemol and ibuprofen can be extremely dangerous if used in cats. In fact, the use of such drugs by misinformed owners is one of the most common causes of poisoning in cats. Some anti-arthritic drugs with a veterinary licence for dogs have been used in cats, but with extreme caution, not only because of the cat's known sensitivity to that group of drugs, but also because the canine preparations are not in a dosage size that are designed to be given to cats. Can Metacam for cats help treat arthritis? That has changed recently with the introduction of a drug called meloxicam in a formulation licensed to treat cats with arthritis or other causes of chronic pain. Marketed under the trade name of Metacam for Cats, it comes as a liquid that can easily be administered orally once a day, using a specially marked syringe. It is one of the products that was formerly available only in a canine formulation, but had been used quite widely off-licence in cats. The feline product is significantly less concentrated than the canine one, so can be dosed more accurately. This is important, as if it is over-dosed, there is a significantly greater chance of developing side effects, particularly vomiting or diarrhoea. It is gratifying that we now have another effective feline product in our armoury to help control what we now know to be a very significant cause of chronic pain in cats. Meloxicam (Metcam) can be used to control pain.